The 0.14.0 Gaphor release has a new element editor widget. 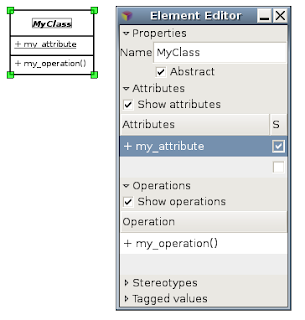 This element editor is displayed as a separate window instead of being displayed at the bottom of the modeling canvas. This allows for more space when working with larger models. Some people are not big fans of desktop applications with multiple windows. In most cases, it shouldn't be necessary. However, any application that requires a type of canvas interface such as UML modeling tools and image manipulation applications, the more space in the primary window, the better. Also new in the 0.14.0 Gaphor release is the notion of abstract classes and static attributes. I myself have been waiting a while for this feature and am pleased to finally see it. Both of these features are illustrated below.